This Christmas story tells us about how sometimes we have to give ourselves the gift of living our own life instead of missing out on it. My synopsis: Finals are done and it’s time to head home for the holidays. Gunn and Nathan would love to spend Christmas together, but their families have other plans. However, a last minute change means Nathan surprises Gunn with a holiday visit. But the surprise is on Nathan who discovers that Gunn isn’t out to his family. Nathan gets to know Gunn’s parents and neighbor, but it still eats at him that Gunn’s parents think he’s the roommate. Either Gunn comes out to his parents or it may be the last Christmas. Much of this story focuses on coming out to parents, and how that can often be the most difficult part of coming out. Gunn is completely out at college – Nathan refers to him as Mr Queer Man on campus – but he’s not out at home. Even though it appears that Gunn’s parents would be completely accepting, he’s worried because he knows from others’ experiences that parents reactions are sometime unpredictable and sometimes even out of character. Gunn even tries several times to come out, but is stopped by different things. One being his neighbor Abby who his mother appears to be trying to set him up with. Abby herself says, “We all want to be what our parents want us to be.” Gunn has difficulty being a person that he thinks his parents may not approve of or want for him. Sometimes though you have to have faith that the people around you will love you for who you are. For all the innuendo that is thrown around in this movie I would have thought that everyone would be on the same page. It makes the film fun to watch though and I found it funny. The conversation with the mother, Gunn, and Nathan about who sleeps on the top bunk is particularly outrageous. At first I thought Gunn’s mother was just about being funny, but I’m pretty sure the innuendo was more cleverly used. Gunn’s family is pretty close, and he gets along well with his parents. Nathan’s family, on the other hand, is at arm’s length and not close at all. They treat Nathan almost as an afterthought which makes him question how they really feel about him. He sees the contrast immediately when he spends time with Gunn’s family, which at times makes it more difficult for him. But part of this film is about finding family, and what better time than at Christmastime. 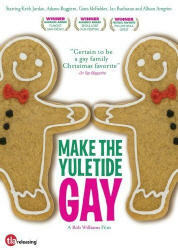 Make the Yuletide Gay isn’t a particularly heavy movie, and the story revolves only around a few key characters. Gunn and Nathan are a cute couple, and Gunn’s parents are certainly interesting people. Even the neighbor is pretty spunky. The story plays out well, although there are just a few oddities here and there. A few scenes may have been a little overdramatic.